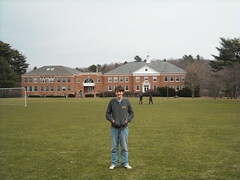 Today was the visit day at Gordon College. We spent the entire day at the school: taking tours, visiting chapel and a class, and meeting with a linguistic professor and other personnel. The campus is beautiful with many new and impressive buildings. The remote wooded setting beside a lake is quite a contrast from the suburban sprawl of nearby communities. The chapel is a huge traditional structure complete with pews, but the student led worship very contemporary. We had a great conversation with the linguistic professor who was very encouraging and engaging. One disadvantage of visiting these colleges is that I wish I were 18 again and do it all over again! Tonight we picked up Brian Bulthuis from the airport and brought him to his downtown hotel and spent a little time catching up. He will be finishing Columbia University in New York next month and came to Boston this week for a job interview. Today was a cold gray day. Maybe tomorrow will be nice.